Have you ever interviewed someone and knew within the first 20 seconds that the meeting was a complete waste of time? And then you had to spend another painful 29 minutes making small talk? Ziggeo (currently in Beta) tries to solve that problem by letting you screen candidates by watching their videos before you meet. Candidates simply click on a link we send you and record themselves for two minutes (answering questions you pose). The videos are then submitted directly to your private screening room. Love this! Terrible idea. I would never, ever, rely on a tool like this when recruiting. Ziggeo is good at one thing: showing you who’s confident/not confident on video. There is little, if any, correlation to their real life skills. Ziggeo looks and sounds to be a very interesting tool. It’s an opportunity to experiment on how it could contribute to a process/workflow, particularly that taken by recruiters. Just when I thought the world of HR couldn’t get any worse, somebody comes up with a solution to deter any talented person with a shred of dignity from even applying for a position. Guess what – you (the interviewer) are being paid to ‘sit through’ an interview. The interviewee is not. Get over yourselves. This is almost as bad as Senior Art Buyers getting together to charge penniless young photographers for ’round table’ sessions with their books. Gentlemen, take a deep breath. It depends on the job that someone is interviewing for and the type of company. This might make total sense for certain positions and none for others. And, if you don’t like it, don’t use it, and don’t apply. im not sure how advantageous this would be for blind dates and roommate filtering (as seen in the testimonials in the screenshot), as the con artists can be quite personable. “Have you ever interviewed someone and knew within the first 20 seconds that the meeting was a complete waste of time? “And then you had to spend another painful 29 minutes making small talk? 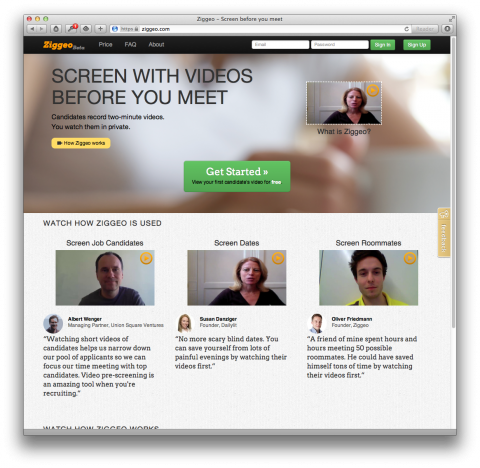 “Ziggeo lets you screen candidates by watching their videos before you meet. Candidates simply click on a link we send you and record themselves for two minutes (answering questions you pose). When one reads the text of your blog post, one may assume incorrectly that you alone wrote the text, when that isn’t the case. It is my opinion that you should specify in your blog post that the text is a quote from the Ziggeo website. The University of California, Berkeley recently did a study that said that by watching someone’s video for 20 seconds, you can gauge if that person is trustworthy, kind, and compassionate (Source: http://newscenter.berkeley.edu/2011/11/14/wired-to-be-trustworthy/). There are lots of uses for Ziggeo (not just for H.R. Departments), including for anyone you might find on Craigslist — childcare, housing swaps, rideshares, personals, etc. You can also use Ziggeo for auditions, applications for schools and scholarships — and, coming soon, for testimonials and blog/media interviews. Seems like with the click of a mouse a person could be discriminated against based on race, gender, age or ….anything really. Seeing how this is already going on, especially in this economy, this service streamlines that process even further. I agree Tina, I will not use the service but it will also change my perspective of any company that I found out was using it. What an awful idea. Is like saying that meeting someone in person and seeing the same person on a computer screen is the same thing. And Ms. Eisenberg you might want to take a deep breath and maybe accept the fact that people sometimes makes disapproving comments too. I think it’s a great idea. When hiring for positions in the past where communication skills were important, I was often flooded with hundreds of candidates who looked good on paper. I’d spend hours and hours setting up and running phone interviews, only to find out that 90% of candidates could be tossed after 30 seconds on the phone. Having a tool like this would helpfully let you toss that 90% with a lot less time and effort. I wouldn’t make a hiring decision based solely on this. But as a screening tool, it sounds like a good addition to the mix. Similar thing has been running for a while in Finland: https://recruitby.net/en/ . They encourage people to make the experience more like a real interview (instead of flash judgement). It still looks like that the recruiters use it for flash judgement instead of listening for the answers. If I would be improving such a system I would add a virtual character you are telling giving your answer to (and make it yawn after 10 seconds to help you to make your answers short). I have done two recruiting campaigns in the last 6 months. It is not about efficiency, it is about finding a person who is a great match for the job and the company. If you have lots of people applying for the job, you did not specify the job well, or you have a very good situation! This time is well invested, saving time in this process is saving in the wrong place. The only way to find out if a candiate is only good at selling herself well, or if there is some substance, is by interacting with the candidate. If I feel the candidate is not the right one, I have the freedom to cut the interview short, nobody tells me I have to talk fo another 28 minutes with her. this really freaks me out. getting in front of a camera can be scary for a lot of people. This is surprising given the fact that many posts here talk about being fair, ethical, and nice. For all the things listed in this thread that are wrong with video interview, there are more wrong the resumé.